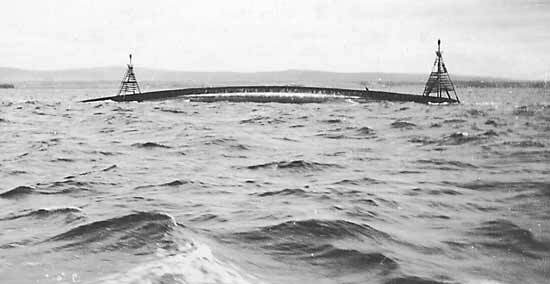 The Natal was sunk in the firth in 1915, by an explosion in the magazine. This shows the hull before it was dismantled. More comments about this picture can be seen on the Invergordon Image Library. It was quite shocking for me to actually see the upturned hull - my grandad was probably still inside the ship as I was looking. To have such strong feelings for somone who died so very many years ago, just a boy leaving a wife and two young babies behind. He was stoker first class Victor George Hurn. I visited this place in 1950s as in my other e-mail 7/06 my uncles remains may also be inside the 10" steel hull. Was told at the time it would be used for razor blades ? So why all the protection on other "grave" wrecks. Oil also has a lot to answer for! I lost my great uncle, Able Seaman Daniel Bigley, aged 23. Back here again !. Ihave this picture in post card form, I also visited the scene in about 1954 on a triumph T100 M/Cycle. my uncle had died here Jack Baylis P/O. my mother his sister was so saddened, I still have several letters from Jack and a large framed photo always on mothers bedroom wall, J.B. is remembered in Adderbury church nr Banbury, from where he departed only days prior to the tradgedy. His medals are in the naval museum Portsmouth. Brian Knibbs. p.s I have asked before, how was it this war grave was allowed to be desecrated / sold? as scrap. My great grandfather, Henry Potts, was a (RNR) stoker on board HMS Natal when it sank. His body was never recovered from the wreck and it seems inconceivable that they broke up and scrapped the ship with those men, women and children still there. So sad. Jan, so nice to keep this important thread going, perhaps "one Day" (100 annv: this year) H.M navy person, or statesman, politition, health and safety guru, may read this thread making comment. H.M.S Edinburgh and several other wrecks are deemed untouchable. ah!... there may be gold in them there!! Makes a difference. My uncle, Jack Baylis. P.O was on board the "coffin". Hi Brian. Perhaps if nothing official is organised we, as the relatives, could organise something ourselves for next year to mark their 100th anniversary? Jan, Brian, please keep me in that loop re the 100 years. Sorry Jan, Brian, a name would prove useful.